New Cocinaware & Recipes From H-E-B! You are here: Home / Great Deals / New Cocinaware & Recipes From H-E-B! H-E-B sent me a great gift! Some of their new Cocinaware! I was excited when I got these – they are so fun and bright they just lift your mood when you see them! It just makes you want to have a party! The Dutch Oven is brightly colored also, which is fun, but it is very functional, too! I love how heavy it is and the lid has dimples underneath that keep your food basted! No more time spent having to check on your meat turning it or pouring more liquid over it to keep it moist! Nice!! Preheat broiler. On a cookie sheet, place the tomatoes, garlic, onion and jalapeno pepper. Drizzle with olive oil. Broil for 20-30 minutes, or until the outsides of the vegetables are charred. Remove veggies from heat. Remove jalapeno stems and garlic skins. In a food processor, coarsely chop the charred veggies. Transfer to the Cocinaware Salsa Crock and mix in the cumin, salt, lime juice and cilantro. Combine the flour, salt and shortening in a food processor bowl and pulse for 4-5 times until flour looks crumbly. Add water to flour mixture and pulse 2-3 times. Remove dough and knead for 4 minutes until smooth. Add more flour by the tablespoon if sticky. Divide into 1 1/2 inch balls and keep covered until ready to roll out. Roll out dough balls with a roller one a ta time to 6 inches in diameter, place sheet of was paper or plastic wrap on top and stack them as you roll them out. Keep covered with towel to prevent drying. Heat a griddle/comal over medium heat. Cook each tortilla for 1 minute on each side and place in tortilla warmer. You can find even more recipes on H-E-B’s website! 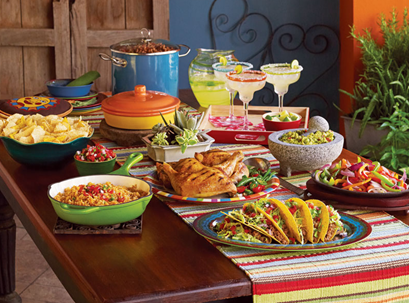 Create a fiesta in your kitchen with Cocinaware, Mexican inspired cookware, kitchen gadgets and tabletop exclusively at H-E-B. This colorful, fun line will give your kitchen a modern look and authentic results. 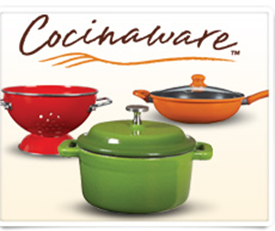 Cocinaware cookware comes in bold, bright colors and a variety of shapes and sizes. From the multicolored whisks to the Dutch oven, all Cocinaware items are unique, affordable and exclusively at H-E-B. · The cast iron heats rapidly and uniformly and goes from the oven or stove to the table with ease. Ideal for sautéing, baking, roasting, braising, frying or grilling! · The tabletop collection has vibrant and colorful styling, sure to create a beautiful presentation at your table. · Add a splash of color to your kitchen with Cocinaware kitchen gadgets; perfect for adding a little zest to your daily kitchen tasks. Buy Cocinaware 10" Enamel Cast Iron Fry Pan, get 1 lb ground beef, H-E-B Ranchera Salsa, H-E-B Flour Tortillas and H-E-B Mexican blend cheese free with in-store coupons! Buy Cocinaware 5.2 qt Enamel Cast Iron Casserole, get Boneless Shoulder Chuck Roast, H-E-B Chipotle and Garlic Salsa Picante, and H-E-B White Corn Tortillas free with in-store coupons! Buy Cocinaware Grande Family Pan, get H-E-B Seasoned Beef, Chicken, or Pork Fajitas, Vermicelli, and Chunky Salsa Picante free with in-store coupons! These yellow coupons are available at a select 150 H-E-B locations. Check to see if they’re available at your H-E-B store byviewing your weekly ad. Thanks H-E-B, for the great set of Cocinaware!